It's time to conjure up the Spirit of Winning and take online slots games to new heights! Welcome to Voodoo Magic, a hypnotic game from Slots of Vegas that takes winning to spooky new levels! We're doing that voodoo thing we do to bring you more rewards than you've thought possible. If you think 13 is an unlucky number, it's time to reimagine everything because this 13-payline game has it all. You could win 25 free spins plus up to 50,000x your bet per line. Ready to enjoy the most mesmerizing game yet to hit Slots of Vegas? Download the free software now and get started. And don't forget your voodoo doll. Who needs a voodoo spell book? To get started playing Voodoo Magic, just use the up and down arrows that you see next to the Bet and Line buttons. You can wager between a penny and $5 per line. You can also play 1 line, all 13 lines, or anywhere in between. Your bet won't be finalized until you click the Spin button. Doing so locks in your bet. The reels will start spinning and as soon as they stop, you'll get paid out based on which symbols you land on. And some symbols are extra-rewarding, like the Voodoo Doll symbol which leads to 25 free games should you hit one on a winning line. Remember, some symbols pay out more than others, so click Help for a full payout schedule. 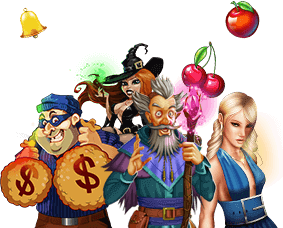 Voodoo Magic comes with a top award of 50,000x your bet per line. But you can't win that much if you don't play all the lines (not doing so reduces your shot at lining up winning symbols). Short on funds? Don't worry. You can still play all the lines and stay in the game. Just reduce your bet per line instead. You'll spend less, but you'll be able to ensure that you're playing at maximum capacity. Scatter Symbol: Look for the Voodoo Doll symbol in this slots game to win big. If you hit one in a winning line, you'll get to play 25 free spins. What's more, scatter wins are added to line wins. And it gets better. They're also multiplied by your bet per line. Wild Symbol:The Priestess symbol is wild. That means if you're one symbol short of a winning payline, you'll be taken care of because the Priestess will work its magic to pay you out. AutoPlay: Want to win even faster? Turn AutoPlay on. We'll do the spinning for you and pay you out if you've won something. Then, we'll spin again. It's magic!